Wheat flour is known to contain some substance that causes allergy. In a recent survey, one out of 10 housewives in Seoul and its surrounding areas responded they have digestive problems after eating wheat flour-based food. A local team of researchers has developed a variety of wheat, called "O-free", that does not cause indigestion or allergic reactions. 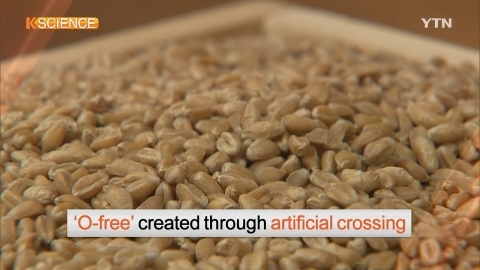 "O-free" is a variety created through artificial crossing between two popular wheat species in Korea. The research team said that O-free does not contain substances that trigger allergies, nor does it contain molecular-weight glutenin subunits which are known to be responsible for indigestion. "We have conducted a protein analysis and serum tests on the newly-developed variety but there were no allergic reactions found. Cookies made with O-free also did not exhibit any different texture." Although there is a small number of patients who are allergic to wheat flour, five percent of Westerners are known to be patients with celiac disease. The global market of allergy-free flour was estimated at 12 trillion won in 2014. The state Rural Development Administration has completed patent registrations in the United States, China, and Europe for the export of O-free.